If you want to lose weight or burn stubborn body fat then CHIZZLED by 7 Lights is a terrific option. CHIZZLED contains proven weight loss nutrients that have clinical studies documenting their effectiveness. To start with, CHIZZLED contains 800 mgs. of Green Coffee Bean Extract (GCBE) per serving, which has been a consistent and successful weight loss ingredient for years. 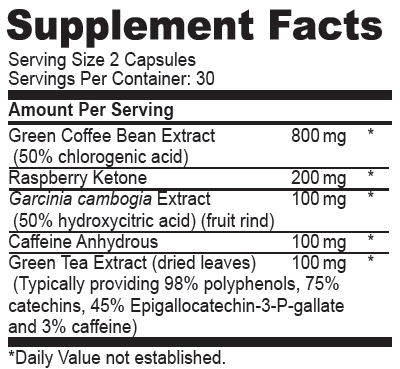 GCBE is one of the most common ingredients used in the leading diet supplement products being sold. Green Coffee Beans naturally contain a compound called Chlorogenic Acid, which is the active weight loss compound in Green Coffee Beans. Green Coffee Beans contain over 50% Chlorogenic Acid. The specific combination of Chologenic Acid and caffeine are proving to be extremely effective for weight loss and fat burning. Chlorogenic Acid works by inhibiting the release of glucose in the body, while at the same time boosting the metabolism or the “burning” of fat in the liver. These two mechanisms work together to inhibit the absorption of fat and eliminate weight gain. Green Coffee Beans have been shown in human clinical trials to reduce the absorption of dietary fat, spark metabolism and thermogenic fat burning, and to control blood sugar levels leading to significant reductions in overall body weight and the percentage of total body fat. In March 2012, a breakthrough human clinical study was presented at the 243rd National Meeting & Exposition of the American Chemical Society (ACS), the world's largest scientific society. The results were also published in the Diabetes, Metabolic Syndrome and Obesity journal. This 22 week study was unique because the test participants from 22 to 46 years old were subjected to three different dosage levels: placebo (no Green Coffee Bean), low dosage, and high dosage. Such studies have advantages since each test subject serves as his or her own "control", improving the chances of getting an accurate result. All the participants were monitored for their overall diet and exercise regimen to ensure no significant change in either during the trial period. The participants ate on average 2,400 calories a day and had a calorie expenditure of 400 calories, nowhere near the levels necessary for weight loss. Participants lost an average of 17 pounds during the 22 week study which worked out to be an average of 10.5% decrease in overall body weight and a 16% decrease in total body fat. It was speculated that the weight loss experienced during the study may have been significantly faster had the participants been on the high dosage of Green Coffee Bean for the entire duration of the study, rather than placebo and low dosage. More interesting was that there were no side effects reported. This is very exciting information and one reason why green coffee bean could be an effective weapon against the obesity epidemic in our country. Research has shown that Green Coffee Beans will positively support your weight loss efforts, especially when paired with regular exercise and a well balanced diet of healthy foods. Researchers have discovered that Raspberry Ketone regulates a protein in humans called Adiponectin. Adiponectin regulates a number of metabolic processes in the body and cells, including glucose regulation, fatty acid catabolism, and thermogenesis. Higher levels of adiponectin are associated with fewer fat stores. Scientists studied the effects of Raspberry Ketones on in vitro fat cells and observed a higher secretion of adiponectin when compared to controls. Adiponectin has been found to play a role in the suppression of the metabolic derangements that may result in type II diabetes, obesity, atherosclerosis, non-alcoholic fatty liver disease (NAFLD,) and an independent risk factor for metabolic syndrome.A handful of studies from Asia suggest that raspberry ketone — which is chemically similar to capsaicin, the heat compound from chili peppers — might help burn fat, especially the fat that builds up in the liver. The reported benefits are impressive. Several studies have shown that Garcinia cambogia plays an important role in the regulation of endogenous lipid biosynthesis. This effect is specially attributed to (-)-hydroxycitric acid (HCA) inhibiting the enzyme ATP-dependent citrate lyase, which catalyzes the cleavage of citrate to oxaloacetate and acetyl-CoA. Several studies have found that the administration of G. cambogia extracts is associated with body weight and fat loss in both experimental animals and humans, although more clinical research is required. There are a variety of studies that validate the use of green tea for health benefits, including weight management and blood sugar support. In one study the authors reported that there was a significant positive effect of catechins on weight loss and weight maintenance. Other studies have shown the beneficial effects of green tea, not only on cardiovascular diseases but also on obesity and type 2 diabetes itself. In a retrospective cohort study performed in Japan, a 33% risk reduction of developing type 2 diabetes was found in subjects consuming six or more cups of green tea daily compared to those consuming less than 1 cup per week. Wu et al. reported that Taiwanese subjects who had habitually consumed tea for more than 10 years showed lower body fat composition and smaller waist circumference. Evidences from epidemiological studies suggest the possibility of green tea being a novel strategy for treatment or prevention of obesity and diabetes. CHIZZLED is not a fluff supplement with low dose ingredients. Our formula contains amounts of these four nutrients that were used in a variety of these studies. While we can't cite a specific study with all of the ingredients used in combination, it is our belief that there is a synergy with these nutrients that makes the sum of all these parts much more effective than any of them individually.